Okay so one of the movie releases I’m the most excited for is the Smurfs – Smurfy Tales. Love that the Smurfs seem to be making a come back! I even saw a bunch of Smurf toys on the shelf today during a trip to Walmart. Get the DVD on Amazon for $10.99 and channel your inner kid by watching these old episodes with your kids. Releases August 18th. Bob the Builder’s been busy with the release of a 3-DVD Lunchbox Set ($17.99 for all 3 movies plus the lunchbox) and Built for Fun, a 2-DVD set that comes with a toy truck for $9.99. The Tigger Movie celebrates its 10th anniversary with a special DVD + Digital Copy DVD Set that’s available on Amazon for $17.99. We’re huge fans of Super Why!, so I was excited they came out with a DVD. 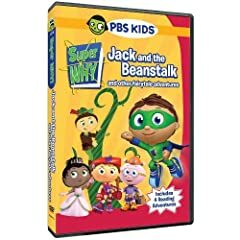 Super Why’s Jack & the Beanstalk and other fairy tales includes 4 other episodes and is available for $17.99 on Amazon. SpongeBob Squarepants – To Squarepants or not to Squarepants includes 8 SpongeBob episodes, $12.99 on Amazon. Marvel fans will like Wolverine & the X-Men: Deadly Enemies that released end of July. You can get it on Amazon for $12.99. 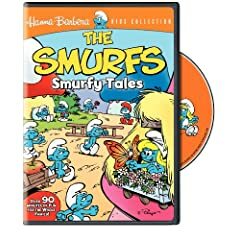 The Smurfs on dvd, I watched them when I was a little kid, I’ll most definitely buy that dvd and I’m sure that my little one will love them just as much as I do.